Nicholas Braun is an American actor who is admired by many people because of his spontaneous and ingenious approach to the make-believe business. He is regarded in many quarters to be an accomplished movie star having featured in several top ranking movies like Red State, The Perks of Being a Wallflower and How to Be Single, where he stunned his many fans with his versatility and charm each time. Today, the actor is best known for the role he plays as Greg Hirsch in Succession, a satirical comedy-drama TV series. Fans of the show are fascinated with his seamless ability to beam a smile on his face whenever gets the chance. Nicholas Braun was born Nicholas Joseph Braun on the 1st of May, 1988 in Bethpage, New York. He was born to a father who is also an actor. His dad, Craig Braun, has appeared in movies such as Swordfish and Great Expectations. His mother has been identified as Elizabeth Lyle. Braun’s parents were reported to have been in a loving relationship, however, they are now divorced. He has three siblings; a brother and two step-brothers who are all in the entertainment industry. His brother has been identified as Christopher Deyo Braun, a singer, and songwriter. His step-brothers, who were born when his father married another woman, have been identified as Guillaume Rumiel, an actor and Timothy Braun, a producer. Growing up, Nicholas Braun attended St. Mark’s School, a coeducational, preparatory school which is located in Southborough, Massachusetts. Having lived with an actor father all his life, he developed a desire to go into acting himself since he was a child. Some reports have shown that Nicholas and his father regularly rehearsed lines and practiced together when he was still a boy. Also, he joined the drama class in his school, all of which helped to shape his interest in acting. Nicholas Braun was just 13 years old in 2001 when he began his acting career after he was cast in Walter and Henry, a TV film. The next year, he got another role in Law & Order: Special Victims Unit, a crime drama TV series. This role helped to build his confidence in front of the cameras as he was gearing up to take the industry by storm. In 2004, the actor landed a role in another TV film called Carry Me Home in which he played Zeke. Some months later in 2005, he made his debut as an independent movie star when he was cast in Sky High, a superhero comedy film. Braun returned to TV in 2006 when he was cast on Without a Trace, a police procedural TV drama series. He then landed a role in Shark, a legal drama series in 2007. In 2008, he landed roles in two series; Minutemen and Cold Case. 2009 was a big year for Nicholas Braun as he landed several roles on TV and film. He landed a role on The Secret Life of the American Teenager, a teen drama series in which played Randy. After this, he was cast on Princess Protection Program and Three Rivers, a medical drama series. That same year he got one of his biggest breakthroughs on TV after he was cast in 10 Things I Hate About You, a TV sitcom which was very popular and won him a lot of fans who found his hilarity really fascinating. He also featured in The First Time, an independent movie. In 2011, Braun scored a role in Prom, a teen romance comedy-drama film in which he portrayed Lloyd Taylor. The same year, he was in Red State, an action horror film which won him high acclaim. Over the years, Braun has starred in other top independent movies like The Perks of Being a Wallflower in 2012, Jem and the Holograms in 2015, How to Be Single in 2016 and The Year of Spectacular Men in 2017. In 2018, Nicholas Braun scored a role in Succession, a satirical comedy-drama TV series which happens to be one of his biggest role on TV so far. The actor continues to act in that role today. 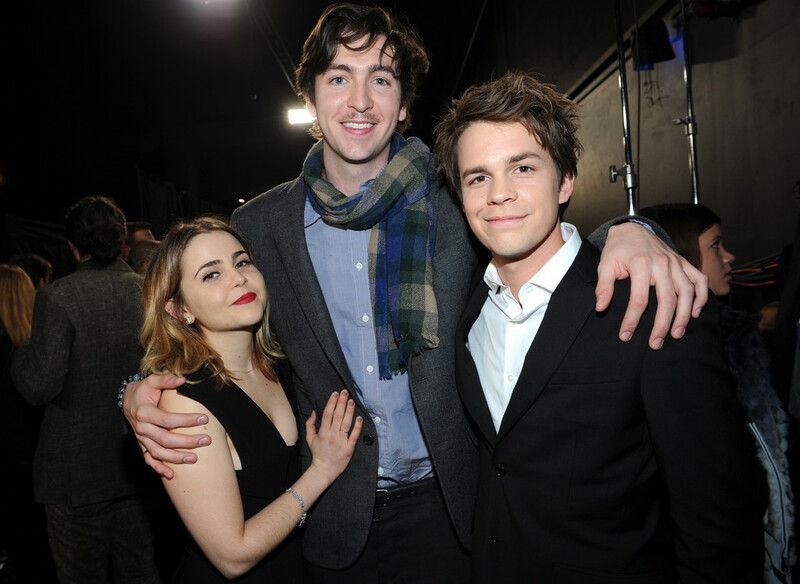 Nicholas Braun poses with fellow movie stars, Mae Whitman and Johnny Simmons at an event. Nicholas Braun is very popular as an actor however details about who he is dating is still quite unknown at the moment. In the past, he has been rumored to have been dated Dakota Johnson, a popular movie star with whom he had acted movies together. However, this was not confirmed by the duo. He was also rumored to have dated Cody Kennedy, an actress who used to be a video vixen. This was, however, never confirmed. Braun was also rumored to be gay after he was pictured kissing another man identified as Christopher Mintz-Plasse. However, the rumor was dispelled when it was found out that Mintz-Plasse has a girlfriend. For now, it is not clear who the actor is dating although it is believed he is in love with a mystery woman. Nicholas Braun is highly admired by his many fans, especially the female ones, for his good looks and hearty smiles. He is also a tall man who towers above most of his friends whenever they meet. The actor now stands at 6 feet 5 inches in height and weighs about 76 kg.